If you’re following a route down the Rambles in search of free art in Barcelona, pause at Plaça Catalunya for Josep Maria Subirachs’ 1991 Monument to Francesc Macià, which shows the harmonious marriage between a contemporary piece and another artist’s much earlier work. 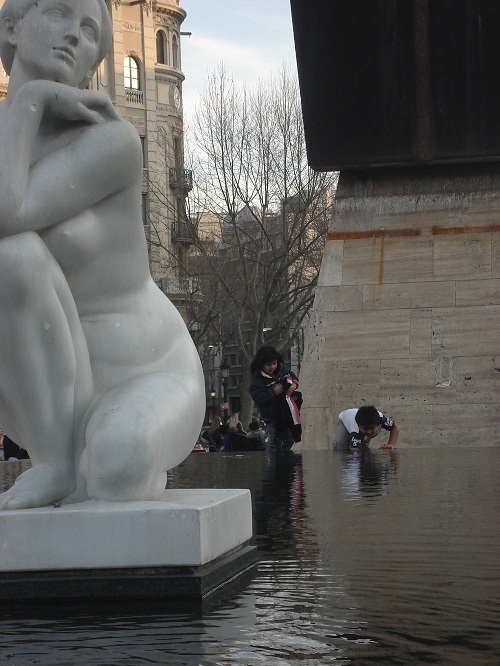 The installation acknowledges Josep Clarà i Ayat’s La Diosa (The Goddess) while allowing the earlier work to inhabit its own setting on the ornamental pond. 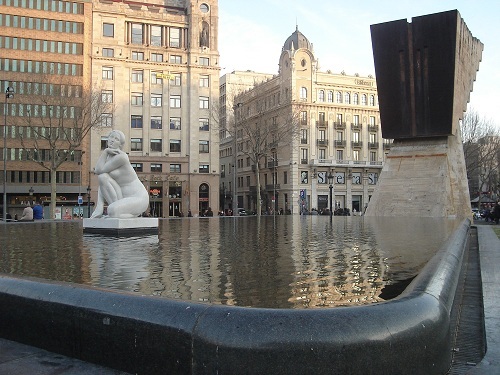 The Goddess links Subirachs’ piece to the collection of sculptures you can see installed around Plaça Catalunya, created for the 1929 Barcelona International Exposition. She is, nevertheless, a copy since the original was removed to the foyer of the Barcelona City Hall for safekeeping in 1982. Subirachs—the artist responsible for the Passion façade on the Temple of the Sagrada Família, the culmination of his artistic career—strove in this commission to pay homage to Catalan president Francesc Macià (1859–1933) and Catalonia. 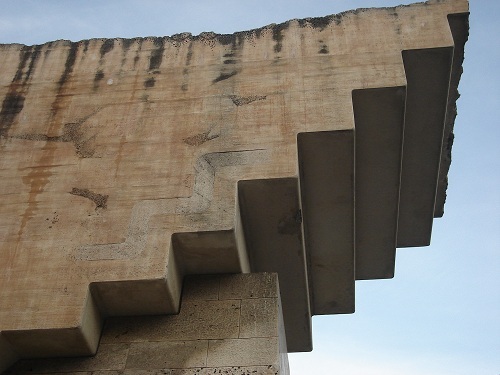 Of travertine marble, concrete, iron and bronze, the solid concrete bastion represents Catalonia’s history while the upside-down staircase symbolises the step-by-step construction of the country’s future. The bust is of Macià himself, a politician and soldier who had been exiled for his involvement in a military campaign to liberate Catalonia from the Spanish dictator Primo de Rivera in 1926. A founding member of the political party ERC (Republican Left of Catalonia, the same that is currently prominent in the campaign for Catalan independence), Macià was president of the Government of Catalonia from 1931 to 1933. Shortly after election, this politician they called “the grandfather” declared a Catalan Republic as “a state of the Iberian Federation”, just a few hours before the Second Spanish Republic was born. However, the initiative was quickly quashed by Madrid and subsequent negotiations led to the compromise of an autonomous region within Spain that was given the historical name of the Generalitat. Macià died in 1933. Continue on down the Rambles for architectural Modernista gems such as the Casa Bruno Cuadros (otherwise known as the “umbrella house”) and Gaudí’s Palau Güell. Otherwise, make a pit stop at nearby Els Quatre Gats, an initiative which the Catalan artists Ramon Casas and Santiago Rusiñol helped found. This restaurant was frequented by many other artists, including Picasso, who held his first exhibition there. 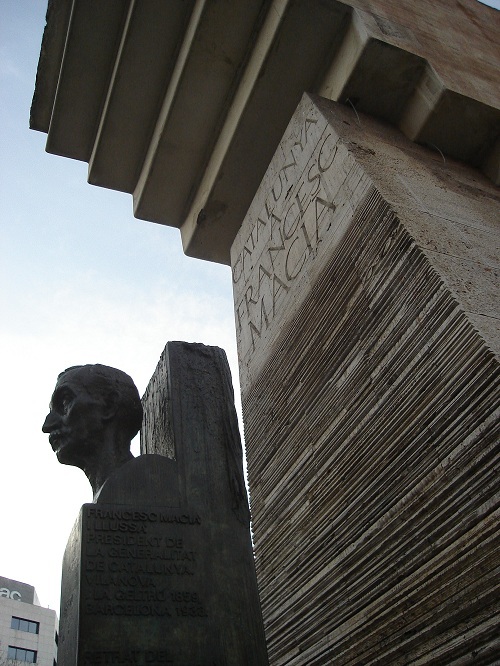 Monument to Francesc Macià (1991) by Josep Maria Subirachs and La Diosa (The Goddess, 1929) by Josep Clarà i Ayat. Plaça Catalunya (at the top of les Rambles).